The Bournemouth Air Festival is more than just an air show, and this year’s Night Air programme extends the true festival feel of the event long into the evening. The electric atmosphere of Night Air, sponsored by Corona and supported by the official Night Air radio partner Wave 105, sees entertainment and events taking place throughout the town, from Bournemouth and Boscombe Piers, the Lower Gardens and town centre. This year will see the return of dynamic dusk air displays and for the first time ever they will be on the Thursday, Friday and Saturday night. The remarkable SWIP Team Twister Duo return to light up the skies with their swishing and swooping displays, O’Brien’s Flying Circus are back with a crazy routine, and, in a Night Air first, the Red Devils are performing three amazing night jumps, complete with glow sticks and dazzling pyrotechnics. There will also be spectacular fireworks on the Saturday night to finish things off with a bang. The Corona Night Air stage, in association with Wave 105, will host a selection of fantastic popular performers on both Friday 30th August and Saturday 31st from 6:35pm. From the brilliant Blue to The Feeling, Stooshe, Lucy Spraggan, Diana Vickers, Kodaline, Johnny Hates Jazz, Neon Jungle and Gabriella Cilmi – there is really is something for everyone! Don’t miss out on this spectacular event. Tickets are just £7.00 and can be purchased by contacting BH Live Tickets on 0844 576 3000 or by visiting bhlivetickets.co.uk and searching ‘Night Air at the Piers’. Bournemouth Pier will be showcasing some terrific tribute acts including The Beach Buoys who will be spreading good vibrations across the crowd and Elvis tribute act Ben Portsmouth, who is keeping the king of rock and roll very much alive. Plus Derek Sandy will be performing his funky flow of reggae rhythms on Friday night, which will ease you into a relaxing summer vibe, perfectly set to the backdrop of the beautiful Bournemouth beach. The East Overcliff will come to life in the evenings when the Band of HM Royal Marines Collingwood brings regal rhythms and visual splendour to entertain the crowds. The Royal Marines Combat Display Team will also be located on the East Overcliff demonstrating their impressive fighting skills with specialists participating in unarmed combat. The Lower Gardens will be filled with family entertainment – from traditional Punch and Judy performances to stiltwalkers and face painting. Get your creative juices flowing with plane & craft workshops for children of all ages and abilities or enjoy some Jazz and Swing music performed by some fantastic artist in the Pinewalk Bandstand. So join in the festival feeling and make sure you’re part of this year’s Night Air. Visit www.bournemouthair.co.uk for more information. Thousands of visitors enjoyed a day of thrilling nostalgia today (Sunday 28 July) as IWM Duxford celebrated the iconic Supermarine Spitfire, the unmistakable Merlin engine and the golden age of motoring. Visitors were able to get up-close to a number of Spitfires on display this morning and have their burning questions about all things Spitfire-related answered by members of the Spitfire Society. Visitors were also able to see Aircraft Restoration Company’s Spitfire Mark V and the Old Flying Machine Company’s Spitfire IX MH434 take off for air displays at Silverstone and land back later in the day. Old Flying Machine Company’s Spitfire IX MH434 is celebrating its 70th anniversary this year and is also celebrating 30 years of being based at IWM Duxford. It also took to the skies in the afternoon as part of a series of Spitfire flying displays. Visitors could also see Merlin engines running in a dynamic display, and meet a range of costumed characters, including an authentic Second World War ground crew, a Squadron Leader in 1940, a Sergeant Pilot in 1944 and a female Air Transport Auxiliary pilot. There was also the rare opportunity to sit in a real Spitfire! Glorious classic and contemporary cars gleamed in the summer sunshine, including a wonderful display of vintage Rolls-Royce cars. Burma Star veterans chatted to visitors about their wartime experiences in the Forgotten War exhibition in Land Warfare. In the afternoon, the Spitfires that had been on static display in the morning, took to the skies for solo displays. It was a fantastic day of iconic aircraft, wartime nostalgia, stunning motors and some fabulous flying! Battle of Britain Weekend is held on the weekend of the 14th and 15th September and the Museum will have plenty of activities for visitors during both days including concerts, re-enactments and film showings. The Royal Air Force Museum is running its first evening Battle of Britain event themed with all things 1940s on the Saturday night – 14th September. Guests will be able to wander around the Historic Hanger and Bomber Hall and gaze in awe at our Bomber aircraft such as the giant Avro Lancaster whilst enjoying listening to 1940s music. The Museum will be offering guests the chance to dress up in RAF uniforms from the period and have their photographs taken. There will be drinks available from our Wessex Bar and guests are encouraged to dress from the period to make the event a really immersive experience. We will be offering a Battle of Britain lecture for anyone that wants to separate the myth from the reality and find out about the personalities and the key events that shaped the battle. We’ll also be showing unseen Battle of Britain footage from our archive and guests will be able to experience a B-17 in our 4D Theatre. Girls will also be able to attend a 40s Hair and Make-Up Class. Bringing their own make-up with them, our freelance artist will teach everyone how to do 40s hair and make-up styles and girls can try their hand at their new skill straight away, ready for the impromptu dance floor in front of the Lancaster. Our last event, ‘Dambusters at Night’ in May welcomed nearly 300 visitors so Battle of Britain at Night is in response to a large number of attendees who begged for another opportunity to visit late, bring friends and have a jolly good time. Entry to Battle of Britain at Night is free of charge to visitors but there will be a £10 charge for the Hair and Make-up Session which should also be pre-booked to secure a place. This event is for over 18s only. The event will start at 6pm and will end at 11pm. Not content with putting on the best air and motoring Show in the UK, Wings & Wheels has added evening entertainment to the weekend line-up with not one but three different sounds to get visitors dancing on Saturday 24th and Sunday 25th August.With big crowds and so much to see and do in the air and on the ground, the Surrey Show is extending the entertainment to 8pm on Saturday so visitors can relax and unwind at the end of the day with music, food and drink. Down in the revamped Military Zone where military vehicles, re-enactors and the aerodromes history can be found, we’re introducing a live DJ from the 1940s Radio Station to recreate the sounds of the 40s from England and America. Swing, Big Band and Jazz will get our dancers jiving and the crowds jumping as they entertain visitors throughout the day until late. Nestled on a stage of straw in amongst some kustom hot rods and vintage shopping, our popular Hot Rod Zone will be rockin through the night thanks to Lights Out. Influenced by The Jets, Elvis Presley, Eddie Cochran and Johnny Cash, Dan, Craig and Lee have toured the UK and Europe as Lights Out with their mix of Rock n Roll, Doowop and Rockabilly. And finally, taking centre stage in the middle of the arena, is local band Geneva. They’ve something for everyone thanks to their huge repertoire ranging from 50’s Rock’n’Roll, through 60’s Soul, 70’s Funk, 80’s Pop, 90’s Indie and the best artists of the present-day. Band members between them have played everywhere from Glastonbury Festival to Everest Base-camp, on TV shows including Later with Joolz, Top of the Pops and TFI Friday, and with legends such as Reef, Ronnie Wood, Kula Shaker, Procal Harem and Freak Power. They’ll keep playing if people keep dancing. Sunday’s not been forgotten as we open the centre stage to a host of up and coming local bands who can’t wait to strut their stuff from 6pm to 8pm. Visitors to Wings & Wheels can also enjoy the world famous Red Arrows, Wildcat Helicopter, Typhoon, Vulcan, Team Breitling Wingwalkers and a host of other modern and historic aircraft during the 5 hour flying displays. For four and two wheeled fans, supercars and both classic and vintage icons put on an awe inspiring display of power and speed on the Top Gear track in a 2 hour auto spectacular from Brooklands Museum. The 9th annual Wings & Wheels will be held over the August Bank holiday weekend; Saturday 24th & Sunday 25th August 2013, at Dunsfold Park near Guildford, Surrey, and is open to spectators from 09:00 until 20:00. Tickets start from £20 for adults, £45 for a family (2 adults and 3 children aged 5 – 15yrs), £6 for children aged between 5 and 15yrs and under 5s are free. Hospitality packages start from £65 per person, weekend passes, grandstand tickets and camping are also available. For more information visit www.wingsandwheels.net or to book standard tickets call 08712 305 572. Wings & Wheels is promoted by Dunsfold Park Limited and in 2013 will be assisting fundraising efforts for Brooklands Museum Trust and Help for Heroes. THE SHOW with something for everyone: that was the verdict after crowds at the Royal International Air Tattoo at RAF Fairford in the Cotswolds enjoyed a feast of flying and static displays, plus a range of new and exciting entertainment on the ground. Following a hot build-up to the show, around 130,000 visitors enjoyed cooler conditions, and were rewarded with breath-taking aerobatic displays from a variety of aircraft, including fast jets, aerial refuellers, transport aircraft, helicopters plus classic warbirds. Two nations made their Air Tattoo debuts in the flying display, the Finnish Army NH90 helicopter and the Estonian Air Force L39 Albatros. And there were two classic Air Tattoo set-pieces portraying the ‘Best of British’ when the RAF Red Arrows flew with the British Airways Airbus A380 yesterday (Saturday) and the Airbus Military A400M Atlas today (Sunday). Around 230 aircraft from 19 countries were on display at the event, whilst 30 overseas Air Chiefs and 49 senior UK military representatives attended. Celebrity guests included Carol Vorderman, Countryfile presenter Adam Henson and Bruce Dickinson from Iron Maiden. Dignitaries included HRH The Duke of Kent, HRH Prince Feisal of Jordan and Chief of the Air Staff Air Chief Marshal Sir Stephen Dalton. The new Chief of the Defence Staff, General Sir Nicholas Houghton, was also present, along with Philip Hammond, Secretary of State for Defence, and Philip Dunne, Minister for Defence Equipment, Support and Technology. Organisers were delighted to report that the mini-heatwave brought out the crowds, with the show sold-out on Saturday and Sunday. With the hot sunny weather looking set to continue into the weekend, organisers of the Large Model Aircraft Rally at Cosford are busy preparing for a scorcher of a show. 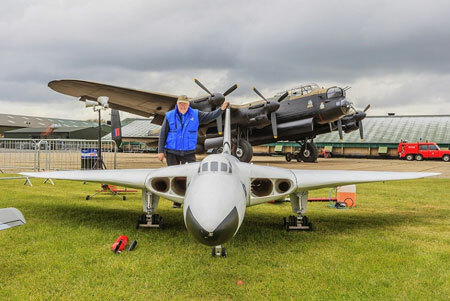 The event which attracts in excess of 10,000 visitors each year is likely to see numbers soar as modellers and aviation fans from across the country enjoy the sunshine at this air show in miniature. Taking place at the Royal Air Force Museum Cosford on 20th and 21st July, there is plenty for visitors to sit back and enjoy. The show is jam packed with two full days of flying and will see huge models of some of the world’s most iconic aircraft performing for the crowds over the airfield. Other activities keeping the whole family entertained include a children’s entertainment area and a wide range of trade stalls, selling all the essential modelling equipment you could ever need, plus lots of non-modelling related items. With temperatures remaining in the high 20’s, organisers are advising visitors to come prepared for the hot weather with plenty of sunscreen and hats. Or why not cool down with an ice cream or a refreshing drink from one of the many on site caterers. For anyone wishing to take a break out of the sunshine, why not peruse the award winning RAF Museum where you can see many of the aircraft on which the models are based. Plus, visitors will have the chance to view the last surviving Dornier 17 recently salvaged from the bottom of the English Channel. For anyone looking to take full advantage of the sunshine, camping slots are available for the weekend, giving you full access to all the weekends action and the opportunity to enjoy a warm summers evening at the RAF Museum, exclusively for this event. On site camping including entrance to the show is only £45.00 for the weekend. Contact Dave Bailey for more details on camping at dave.bailey08@tiscali.co.uk or call 07827 675665. Tickets on the gate cost just £10 per adult and £8 per senior citizen. This time for the first year, children under the age of 16 are FREE, making this the perfect affordable summer’s day out for the whole family. Gates open at 8.30am and flying starts a 9.00am. Unfortunately, free admission to the Museum is not possible this weekend. For further information about the show and for on the gate prices, please call the Royal Air Force Museum Cosford on 01902 376200 or visit the Museum website at www.rafmuseum.org. 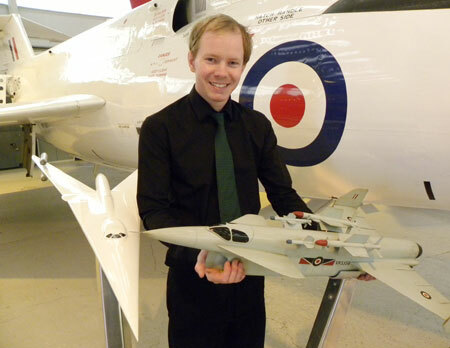 Now on display at the Royal Air Force Museum Cosford is a collection of original aircraft concept models designed by some of Britain’s biggest aircraft manufacturers during the 1940’s, 50’s and 60’s. These pioneering designs never made it off the drawing boards. Visitors to the Museum will now have the chance to see some of the revolutionary ideas up close, as they go on display in the Museum’s Test Flight Hangar. The collection brings together ten original pieces of aircraft design, including one by Barnes Wallis creator of the Wellington Bomber and the famous bouncing bomb used during the Dambusters Raid. Wallis’ design for Vickers known as the Type 010 or ‘Swallow’ was one of the more unusual projects of the 1950’s. This large swing-wing aircraft was designed with the ability to travel at both supersonic and subsonic speeds whilst the engines could rotate and tilt, acting as control surfaces. The proposals were not seen as practical by Government officials although the Air Staff seemed interested and despite Wallis’ best efforts, the Swallow was cancelled in 1957. Many of the designs were far in advance of their time and only a few made it into construction before later being cancelled by the Government. Those which never made it any further than design concept were ambitious and many had their setbacks, as was the case with the Supermarine Type 559. This interceptor featured two de Havilland Gyron engines with afterburners and two de Havilland Spectre Junior rocket engines, whilst its design featured a Canard layout where the tail-wing was moved to the front resulting in fins being placed on the main wing tips. It would have been a fully integrated weapons system, with technologies beyond its years had it made it into service. These new additions to the Test Flight Hangar gives the Museum the chance to bring from storage some items relating to aircraft designs held in the Museum collection. Models range in size from 2ft to 4ft and are made from, wood, plastic and metal, each with their own caption boards detailing the design concept and the expected results. Other models on display include: The Bristol Type 204 – a state of the art bomber; the Bristol Type 178 – a rocket fighter designed to intercept high flying, supersonic bombers; the English Electric P.10 – a high speed reconnaissance aircraft that would have spied on targets before and after a V-Bomber raid; the Hawker P.1103 – thought to be capable of intercepting a supersonic bomber at 60,000ft within 20 minutes of take-off, the Fairey Delta 3 – a high level interceptor designed to catch incoming Soviet bombers; the Saunders-Roe SR.177 – the planned successor to the experimental rocket powered SR.53 which was cancelled during construction; The Avro 730 – an ambitious reconnaissance aircraft cancelled during construction; the Armstrong-Whitworth 681- a post war transport aircraft capable of carrying vehicles or 60 paratroopers and finally the Fairey Project 75 – designed to be a lightweight aircraft with a short take off run. Anyone wishing to take a look at this unique collection, the concept models are now on permanent display, located in the Museums’ Test Flight Hangar. Admission is free of charge. For more information on the Museum please visit www.rafmuseum.org or call 01902 376200. Whether it’s the police, ambulance or fire and rescue, the speed and effectiveness of the UK’s airborne emergency servicesin responding to an incident can often be the difference between life and death. Thanks to Eurocopter UK Ltd, their capability and professionalism will be demonstrated in vivid fashion when a dramatic rescue is enacted at the Royal International Air Tattoo at RAF Fairford in the Cotswolds on July 20-21. From search, surveillance and crime detection to casualty evacuation and air ambulance airlift, the rotary wing aircraft element of the UK’s frontline response unitsare on 24-hour standby to provide vital support wherever it is needed. In a recreation of an emergency scenario, the National Police Air Service, London Fire Brigade and Devon Air Ambulance,operating three Eurocopter helicopters, will demonstrate their capabilities to Air Tattoo spectators. As the drama unfolds, a Police EC135 helicopter will overfly the scene to aid co-ordination whilst an EC145 with a fire service team on board will attend the incident along with an EC135 air ambulance. The demonstration is part of the Air Tattoo’s Sky Guardian theme which will turn the spotlight on civil and military aircraft operators who play an important role safeguarding life, land and liberty around the globe. Air Tattoo Chief Executive Tim Prince said: “The demo will be a rare opportunity for the public to witness the airborne emergency services’ skill and bravery, often working in situations none of us would want to find ourselves in. Among the other highlights in the airshow’s seven-and-a-half hour flying programme will be displays by the Vulcan bomber, fast jets including the Typhoon, Gripen and Rafale; six aerobatic display teams including the RAF Red Arrows; the Battle of Britain Memorial Flight plus a number of unique joint flypasts. The Royal International Air Tattoo takes place at RAF Fairford on July 20-21. For a full list of all the visitor opportunities and to purchase tickets, visit www.airtattoo.com or call 0800 107 1940. All under-16s go free. Free parking. 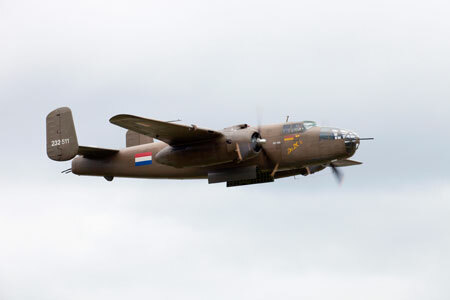 Some 70 years after the B-25 Dutch Mitchell Bomber first arrived at Dunsfold Aerodrome it will be back in our skies for Wings & Wheels on Saturday 24th and Sunday 25th August 2013 thanks to the generous support of the Royal Netherlands Air Force Historic Flight. It was August of 1943 when the menacing silhouette of the first of the North American B-25 Mitchells was spotted in the skies above Dunsfold. The aircraft was easily recognisable due to its twin tail rudders, two engines and unusual tricycle undercarriage which, although very much the norm today, was a daring innovation of its time. The aircraft was used in the defence of the country and in connection with the Allied invasion and liberation of occupied Europe and continued to be based at Dunsfold Aerodrome until 1946. Following the Mitchells’ participation in D-Day, they were billed as ‘Heroes of the Night’. Over 50 aircraft are booked to appear at the Flying Legends Air Show, on Saturday 13 and Sunday 14 July, in a spectacular aerial celebration of historic aviation. The Bremont Horsemen Flight Team will present the worldwide debut of their thrilling new display in a trio of Supermarine Spitfires, including two rare Mark I variants. To showcase the incredible lineage of the Supermarine Spitfire, we are proud to present variants ranging from the Mark I to the Mark 19, flying alongside their old adversary, the Hispano Buchon (Messerschmitt Bf 109). 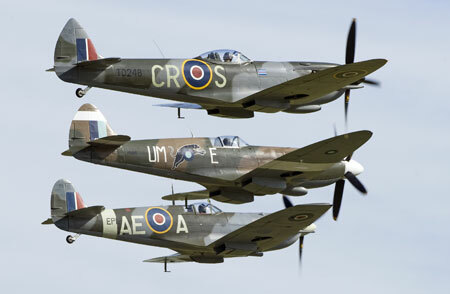 These aircraft will take part in choreographed dogfights reminiscent of the Battle of Britain above IWM Duxford’s historic Second World War airfield. The Fighter Collection is pleased to present a melee of Mustangs including two rare blue-nosed Mustangs, Moonbeam McSwine and Princess Elizabeth. They represent aircraft flown by Captain William T Whisner of the 487th Fighter Squadron, 352nd Fighter Group at RAF Bodney, Suffolk in 1944. When the 352nd Fighter Group discovered that they were to be honoured by a visit from the then Princess Elizabeth, they decided to christen Bill Whisner’s aircraft in her honour. Unimpressed by this imposition on his beloved Mustang, Bill soon changed the name to Moonbeam McSwine. Princess Elizabeth arrived at IWM Duxford in May this year to display as part of the Eagle Squadron commemoration at the Spring Air Show. This is a rare opportunity to view this US-based aircraft in the Duxford skies once more before her return to the USA. Making a welcome return is the Flying Bulls’ Chance Vought F4U-4 Corsair reg. OE-EAS. 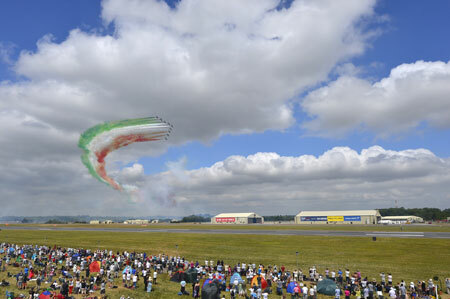 The Flying Bulls’ stunning aerial performances always wow the crowds at the Flying Legends Air Show. The biplane era will be celebrated by a four-ship display comprising of two Hawker Nimrod aircraft, a Hawker Demon and a Hawker Hind. These glorious aircraft are instantly reminiscent of the golden age of adventurous aviation. Continuing this bygone theme, we are pleased to announce that two Gloster Gladiator aircraft will fly together for the first time at the Flying Legends Air Show and indeed anywhere else in the world. A celebration of Curtiss aircraft includes The Fighter Collection’s Curtiss P-40B Warhawk , the only remaining airworthy survivor of the Pearl Harbor attack on 7 December 1941, and their Curtiss P-40F Warhawk, one of only two airworthy examples of this variant in the world. Favourite aircraft returning to the Flying Legends Air Show include the Deutsche Lufthansa Berlin-Stifutung Junkers Ju 52 and Messerschmitt 108; B-17 Flying Fortress Sally B; Dakota Norway DC3 and on Sunday 14 July only, the Battle of Britain Memorial Flight Lancaster will join the Flight’s Spitfire and Hurricane for a commemorative wartime display. The wartime atmosphere continues across the museum. The Vintage Village, situated on the hangar base next to Wing Co Joe’s Café, offers the perfect nostalgic destination for some rest and relaxation. Enjoy authentic thirties and forties songs sung in true Andrews Sisters-style by The Manhattan Dolls, who will have flown directly from New York to perform for visitors to the air show. The Wilmslow Concert Band will be performing 1940s swing band classics. Don’t miss the chance to clamber aboard the Home Front Bus! This unique living history experience contains detailed reconstructions of a 1940s living room, a wartime shop, a bombed-out street and an air raid shelter. Enjoy a glass of fizz from the Prosecco Bar and take the weight off your feet in our traditional deckchair seating area. 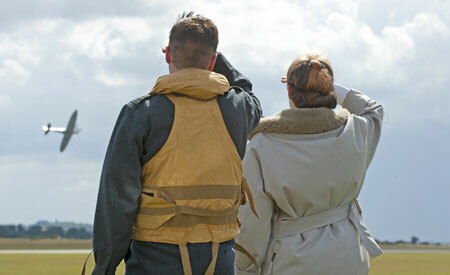 Complete your 1940s day by sitting in a replica Supermarine Spitfire! Ops 1939-45 represent Battle of Britain-era RAF pilots and ground crew with uncanny accuracy. They will present a dispersal point display at the Flying Legends Air Show, where they will be chatting to visitors as they await the call to scramble. They will also be hosting Bomber briefings, where, as members of Bomber Command, they will tell you about your target for tonight and get you ready for your bombing mission. The 42nd Field Hospital portrays US Army medical personnel from the Second World War, while the Screaming Eagles Living History Group will be representing servicemen who served with the 101st US Airborne Division, 506th Parachute Infantry Regiment, 2nd Battalion, Easy Company during the Second World War. They will have displays at the air show and will be bringing the 1940s to life in US style. We’ve got fun family activities happening between 10am and 2pm, in AirSpace, next to the Lancaster, where you can get hands-on with RAF Bomber Command historical objects. If you love the sound of a Merlin engine, don’t miss the dynamic display of seven instantly-recognisable historic engines on the airfield jet pan, including two Merlins, a Griffon, two Leonides, a Napier Lion and a Hercules. Join us for another unforgettable Flying Legends Air Show! Advance booking has now closed but you can still purchase your ticket on the gate on each day of the air show.